Love is in the air, so celebrate the season of romance with a Valentine's Day party. Pick out an invitation that fits your guest list whether you're hosting adults, kids, or teens. 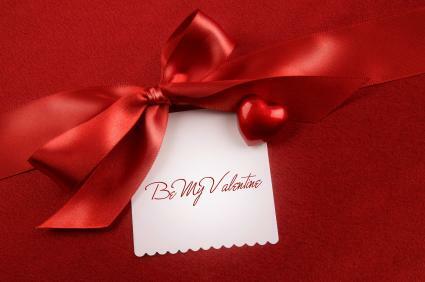 Save your money for your honey by printing free Valentine's party invitations by clicking on the appropriate one below. These invitations are editable, so you can fill in your information. If you need help downloading the printables, check out these helpful tips. This elegant invitation is sure to please anyone who wants to impress his or her significant other on the most romantic of all days. The shades of pink, heart background, and flourished graphics all have a sophisticated quality to them, making them ideal for an adult gathering. Click to download and edit this invite. Youngsters are happy to play games, visit with their friends, and eat special Valentine's Day treats. Pick an invitation that has a fun theme instead of one focused on romance. Download and print this invitation. Teen couples and singletons alike will be happy to get an invitation to a party hosted by a friend. This invitation has a hint of romance without being too grown-up or juvenile. Use this invitation for tweens and teens. 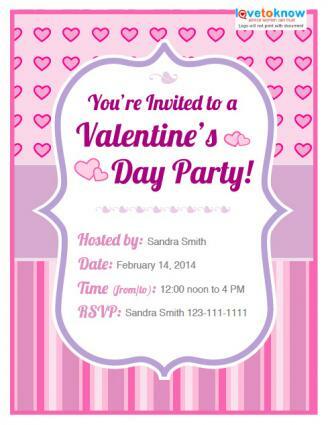 If you don't have the time or inclination to print invitations at home, there are several other options available to use for your Valentine's Day party. Purchased invitations can be filled in online and mailed. Be sure to double check the pricing before you buy, as pricing often varies by the number you order. InvitationBox: At InvitationBox, you'll find invitations for almost any type of Valentine's Day party you want to celebrate with. 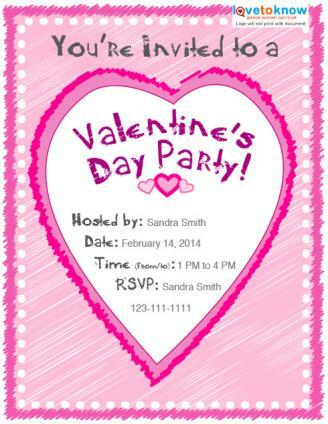 Options range from sweet cupcake designs to fun rocking guitar designs for kids - in fact, they even have an "anti" Valentine's Day party invitation! Tiny Prints: Pick out a festive invitation that is sure to get everyone excited for your upcoming party. Choices vary but you'll find plenty to choose from like vehicles and princesses for kids, trendy takes like moustache graphics, and elegant ones sure to please anyone. Paper Style: Visit Paper Style to see a variety of creative invitations for Valentine's Day. Look for cards with chocolate graphics, animal prints, die-cut designs, and even special folds for an invitation that will make a statement. Card and stationary stores, discount stores, and party supply stores will also carry an assortment of invitation cards. Look for these to arrive on shelves shortly after the New Year. These invitation packs usually come with anywhere from eight to 10 invitations in a pack. Once home, you can fill in the essential party information by hand. An email invitation is a quick way to let everyone know immediately about your party plans. These are best for adults and teens who check their accounts on a regular basis. For example, pingg allows you to sort the invitations by the style you desire, from romantic to kid-appropriate. They also have ones that feature your photograph, perfect for couples or those with kids who want to show off their love. Check out the humorous category to find some that are perfect for your friends who like a little tongue-in-cheek humor during this hyped up holiday. Companies who create email invitations update their designs seasonally, so you may have to check back with sites like Evite as the holiday draws near for the best selection. Every great party starts with a festive invitation. 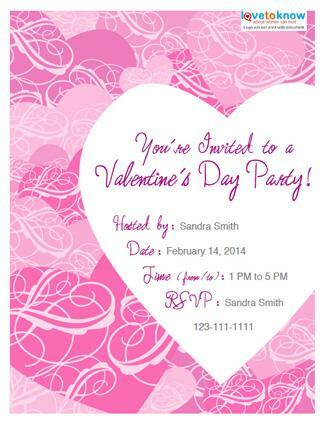 These Valentine's Day party invitation options allow you to pick the one that will best reflect your style of get-together, regardless of your relationship status.